Last year the title of the Best European destination was awarded to Zadar, and this year too Croatia has a reason to be proud! Although not awarded title of the best, Stari Grad on Hvar island is, along with more renowned titans Paris, Milano and Athens, shortlisted as one of the best European destinations you must visit in 2017. Lack of mass tourism, rich renaissance and baroque architecture as well as the impressive Stari Grad field (UNESCO World Heritage site) make this ancient little town (this year Stari Grad celebrates its 2400th birthday!) a destination totally worth your visit. Book an apartment or room in Stari Grad on Hvar and see for yourself why it was chosen as one of the best european destinations in 2017. Unlike its neighbour Hvar which made a world wide reputation due to its exciting night life and many world music and movie stars that visit it, Stari Grad, although full of interesting things to do is not overrun by mass tourism so it's an ideal place for all of you who want to unwind on your vacation. A stroll through the town's centre is a stroll through its rich history. Make sure you visit Tvrdalj fortress, which was also a summerhouse of Petar Hektorović, one of Croatia's most prominent writers of the Renaissance. The awe inspring walls hide a fishpond, a dovecote just above the fishpond and a park. The summerhouse was built by Hektorović so one could go here for a rest and for a reconnection with nature. West from Tvrdalj fortress one can find the city museum placed inside the palace of the Biankini family built in the 19th century in a neo renaissance style. Although it went through many bombings during the world wars, it was renovated and turned into a museum. Today one can find there a big collection of archeological findings from old antiquity. There's also an exibition room where works of Hvar's painters are displayed. In the vicinity there's also the baroque church of saint Roko, patron saint of Stari Grad, whose nameday is celebrated on August 16th with a religious procession and a grand celebration. The church of saint Stjepan is also built in the baroque style in the 17th century. It's located on the samnamed square which was once the hotspot of the town's public life. Peek into the church and you'll be amazed by a number of paintings and altars made by artists from Venice. In Stari Grad one can find smaller, but nonetheless beautiful chruches like the early Christian church of saint Ivan, the church of saint Lucija which is actually a remain of a female convent and the church of saint Nikola which still has the gilded wooden altar from 1612. There are two city beaches in Stari Hvar where you can relax and have a swim. On the south side, just a 10 minute walk from the town's centre you can find Lanterna bathing site which consists of two beaches – one stony, one pebbly. Also, there are showers, changing rooms and deckchairs. After swimming in the clear blue sea, guests can refresh themselves in a nearby caffe. 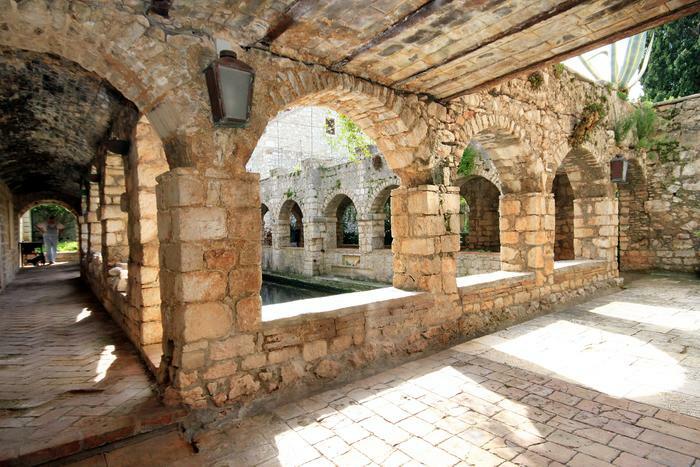 On the north side of Stari Grad there's the Banj bathing site which families with children will like. It's pebble beach is also not devoid of content. Those of you who like longer walk, riding your bike or maybe just want to try out the sea at different beaches should go to the Kabal peninsula which hides over 20 coves and beaches.